ThermoSolar TS300 have the potential to generate all of you hot water needs. These flat solar panels with a super sleek low profile have a high performance of 1379W. They have a gross area of 2.03m² and weigh only 37kg. There is a wide range of installation kits to fit from 2 to 10 panels suitable for most roof types and sites. Overview of technical specifications, dimensions, weight and other details about the TS300. ThermoSolar TS300 solar panel is a vertically mounted glazed collector without collection pipes, intended for applications in systems equipped with circulating pumps. The panels have an integrated connection system enabling pressure sealed linkage with adjacent panels. The ThermoSolar TS300 panel is constructed with a single meander system piping without using soldering or welding and is folded into the absorber plate; a single piece tray folded into the frame holding the glazing. ThermoSolar TS300 solar panel is not intended to be used in drain-back systems. Cover glass: Safety solar glass 4mm thick. Casing: Stamping from non-corrosive Al-Mg sheet. Thermowell: To accommodate Ø 4mm or Ø 6mm sensor. Tested to EN 12975 (parts 1 & 2) and to Solar Rating & Certification Corporation Standards for the United States of America and to all applicable Canadian test standards. 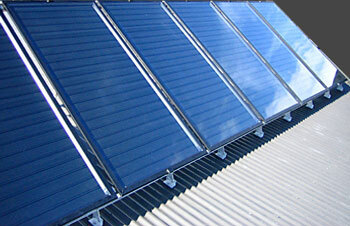 ThermoSolar TS300 panels do not require any maintenance. The panels have been designed to withstand high temperatures; the glass does not require cleaning. There are no user serviceable parts inside and due to the heat exchange process the panel does not contact potable water or water to be heated. Glycol can be heated to very high temperatures and contains anti-freeze properties. This makes it a perfect heat transfer agent as it travels through the unique one piece meandering pipe built into the panel. The insulated piping then transfers the heat from the solar panels to a high quality Varmeco Solar Pump Station. 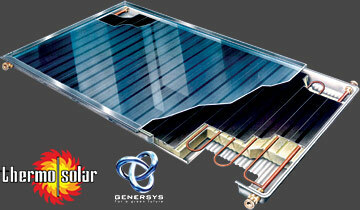 Genersys 1000-10 panels do not require any maintenance and have been designed to withstand high temperatures. The glass does not require cleaning and there are no user serviceable parts. Genersys 1000-10 panels have a 20 years performance guarantee and an expected lifetime of more than 35 years. Due to the unique design of the panels they will not corrode, overheat or freeze. Genersys panels are each filled with 1.57litres of a heat transfer fluid, Glycol. This ensures the system will have a long life with optimum performance. See also Genersys' YouTube Channel for solar panel installations, pool heating, case studies & news and the Genersys Testimonials.